BEWARE HairSite users! Do not show any photos on HairSite! BEWARE HairSite users – Do not show any photos on HairSite! “You are the moron with the butchered head and almost none growth in the reciepient area. Just [search] for “butchered” and you will find much more (always produced by the same users!) of such psycho-rants attacks on HairSite, produced by such psycho-users! BEWARE, HairSite will NOT protect you as a victim of such psycho-rants-attacks against you! It is indeed interesting! YOU know YOUR age!!! And you let your multiple accounts communicate with each other. » such psycho-rants-attacks against you! Yea, sure, “we“ is fully aware about the “special we’s“! 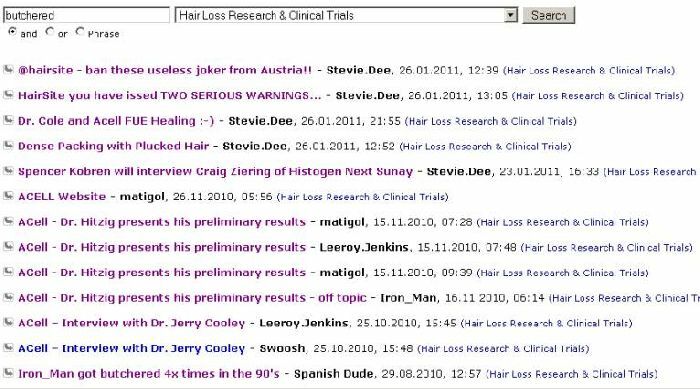 … they just block serious infos for all those users, who are SERIOUSLY interested to know what’s going on concerning emerging future hair loss treatments. Seriously @HairSite & HairSite users, check out their user accounts and posts (links above), and you WILL know more about “we” and what “we” is doing! Right, “they are all heros” - but you shouldn’t read to much comics, little psycho-boy. “We” is the only one who is EXTREMLY psychopathic obsessed about Dr. Hitzig & ACell (including his photos and his “breakthrough” story) since its beginning one year ago! Besides “we”, NOBODY is writing crap like “Yesss” and/or “ähm” and the finger crap including the rants against Dr. Hitzig & ACell SPEAKS FOR “WE”! who is retarded enough for using a “Batman” and “IronMan” combination as username, in a sick attempt to blame the “real user”? Yea, THAT is sick! And “sick” is definitely using proxy’s and multiple accounts, because a guy like me DOES NOT NEED multiple accounts – or is someone “supporting Iron_Man”? NO, because “super-heros” DO NOT NEED support, loser! » BEWARE HairSite users – Do not show any photos on HairSite! I totally agree with Iron Man here. this site is supposed to be about helping each other find a solution to baldness making fun of people’s baldness or failed transplants really is highly inappropriate and immoral, regardless of who it is directed against. » » BEWARE HairSite users – Do not show any photos on HairSite! » » [Interesting, how does a “new user” know my age? » » such psycho-rants-attacks against you! » regardless of who it is directed against. How about all of ye F@*k off and leave this site for people who dont want to fight or act like children. Ye are immature idiots who argue over the internet. Just get lost and give civilised people back the forum. And no dont respond with he said this he said that post trying to justify it anyone who has taken part in these arguements is a total clown. Everytime we decent people go on this forum we see ban this guy ban that guy, just get lost all of you immature idiots. have you seen his jokes about handicapped childs? now he is whining - he can dish it out but he can’t take it! but principally you are right. we shouldn’t let us down to this niveau. » » regardless of who it is directed against. » can dish it out but he can’t take it! » but principally you are right. we shouldn’t let us down to this niveau. For such a PSYCHO like you, the term “niveau” does not exist! And “he” is Iron Man and not “Leeroy.Jenkins” aka “Stevie.Dee”, psycho. I have several times proven with HARD FACTS that you’re just an extremly faulty psycho on the internet. Now it’s up to you to PROVE that Iron Man posts “jokes about handicapped childs” and that Iron Man is “Leeroy.Jenkins”, aka “Stevie.Dee” = the same psycho like you psycho. matigol, YOU ARE an extremly faulty PSYCHO! Ahhh Iron Man ridiculous as always. Btw our age well you said it in the hair transplant forum yourself that you had an backstory like some user there. Also you showed everyone your fine piece of work at the back of your head. » Also you showed everyone your fine piece of work at the back of your head. Psycho, Loser or Psycho Loser. Dont switch titles here it makes it difficult for you to grasp because when moren then three things are involved your attention span decreases rapidly. Oh and did your get your appoitnment for your Gho full hair NW -3 restauration yet? But there is one thing good here you seem to get really tired of yourself thats why you can only keep on posting one word. Oh and it seems that you are on the brink of being banned at Bald Truth cause they even dont care about your bitching any more. rapunzal, Leeroy.Jenkins, Steve.Dee, RichardDawkins - so I would suggest try it with “Steve.Wonder” too on the “Bald Truth”. » try it with “Steve.Wonder” too on the “Bald Truth”. » » try it with “Steve.Wonder” too on the “Bald Truth”. Let me guess - as “pinocchio” too? A proxy is a cool thing - you told me so. But the police told me that is not such a problem for them to identify such psychos anyway today. » » » try it with “Steve.Wonder” too on the “Bald Truth”. » Let me guess - as “pinocchio” too? » not such a problem for them to identify such psychos anyway today. Wait you saw the police, didnt they put you back in the asylum then? Well well cops from austria seem very busy these days. “You dont have a rep you are a psyco” yes yes IronMan whatever you say. » » » » try it with “Steve.Wonder” too on the “Bald Truth”. » » Let me guess - as “pinocchio” too? » » not such a problem for them to identify such psychos anyway today. » well cops from austria seem very busy these days. » “You dont have a rep you are a psyco” yes yes IronMan whatever you say. Oh, sorry, I forgot “LarryDavid”. So I think “LarryHagman” might be cool too for you.